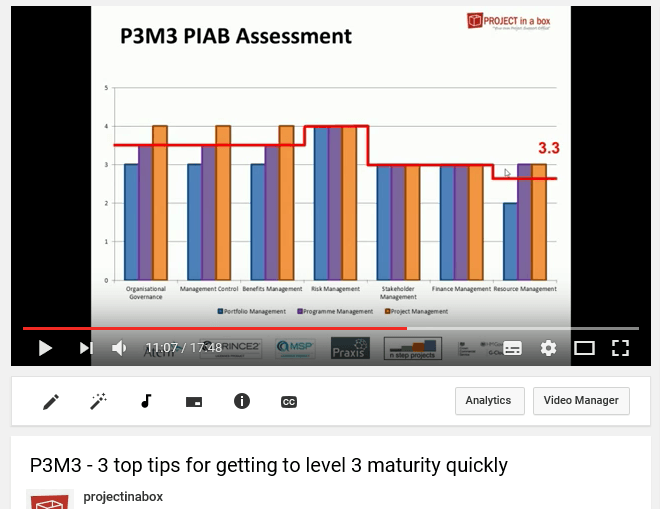 P3M3 is the Portfolio, Programme and Project maturity framework. You can use the framework to check your maturity on a scale of 1-5. As a result of knowing where you are on the scale you can identify which next steps to take. Axelos own, define and regulate the assessment process which has a number of options. You will almost certainly want to undertake a self assessment first. Your next option is a Full certification assessment by an external consultant and usually costs more and takes longer to achieve. Finally you could have a Full certification assessment with additional diagnostic. With this option you also have the possibility of a robust improvement plan to help map out next steps. You look at the scope topics in each of these areas and as a result get a score on the 1 to 5 scale. Therefore as you roll up your scores across the perspectives you will get a per model score. Finally your total across the models will give your overall maturity score. We have helpfully run through this in a video which you can see here on YouTube. If you can’t access YouTube it is also visible directly here. Axelos kindly make the intro guide to P3M3 available to download here for free. As a result of your assessment you will likely identify areas of weakness and will want to improve. The areas you might to able to affect will depend on your current maturity level. many of you will be just starting this journey and have a low level perhaps one or even zero in some perspectives. In these cases you need to take care to look for improvements which can be built on a low maturity level. PROJECT in a box provides three quick wins which can get you from a low starting point quickly to maturity level three. Our second P3M3 video talks you through this and also refers to the experiences of other customers who have already taken this journey. You can see this 2nd video here in YouTube or if you can’t access YouTube, then here on our site instead.